These make great places to take selfies, family photos, work photos, or just group photos in general. Step and repeat banners are also popular as backdrops for tables, recording, and for hiding damaged or old walls. Custom themed backdrops are also great for weddings, proms, birthday, parties, and other non business related events. Since these come in all sizes, you can usually fine a size suitable for most indoor events. Let’s start off by sharing the fact that the National Association of Advertisers has concluded that on premises signs cost much less per impression than any other form of advertising. Surveys have shown that on-site signage typically increases foot traffic between 20-50%, compared to 8% for newspaper, 2% for radio advertising, and 5% for television advertising. Yes, you read right – 20 to 50%! So stop wasting money on other forms of advertising, get yourself flags, banners, and other signs that actually bring you a return on your investment. Increase your businesses sales and get more people to attend your upcoming events with our high quality custom feather flags. 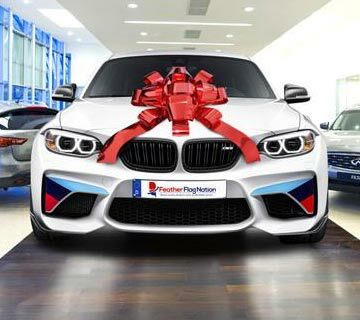 Design advertising flags yourself or send us your files (logos, images) and we can design them for you for free. 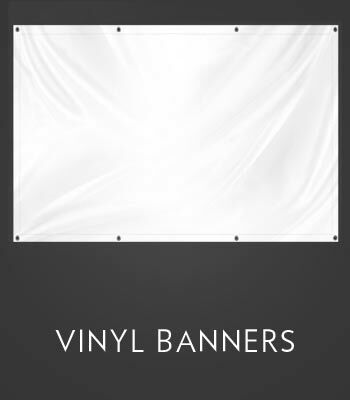 We also have feather flags, vinyl banners, and outdoor advertising banners in stock and ready to ship. All of our flags are Made in the USA with high quality materials, Most of our orders ship the same day if the order is placed before noon. These amazing and colorful stock feather flags can increase your sales by up to 20%. Find the flag that fits your business and start making more money now. Contact us for more info about custom flags. 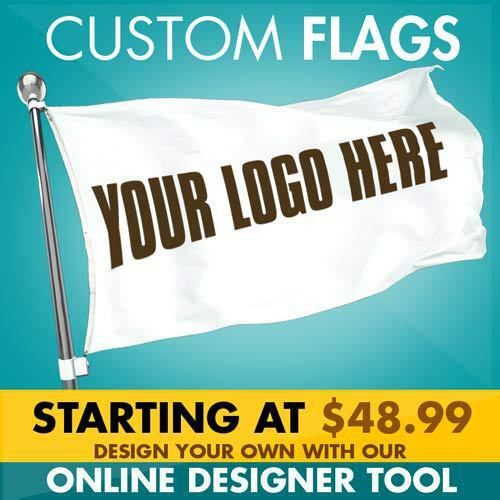 As of May 2017, we have an online design tool which allows you to create your custom advertising flags directly on the website. Let your creativity loose and create some awesome signs at some of the lowest prices on the web. We’ll always double check your files to make sure they are print ready — if not, we will contact you. So design with no worries! You can upload your own images or take pictures on the fly with your cell phone. 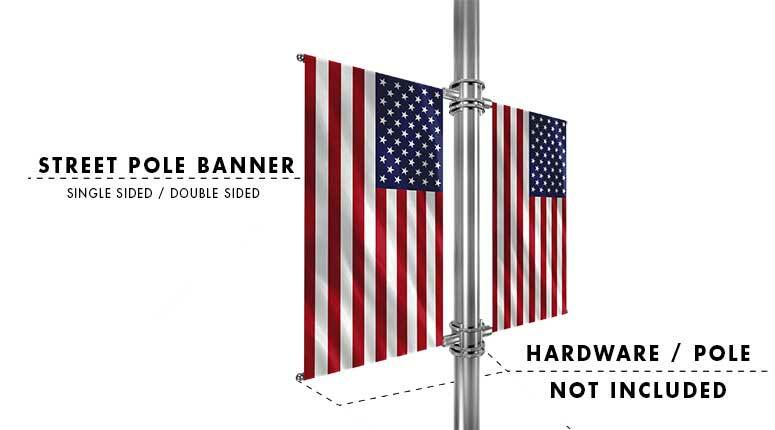 We have 4 standard sizes that you can purchase for custom flags – 2×3′, 3×5′, 4×6′, and 5×8′. Sizes allow options for all budgets. 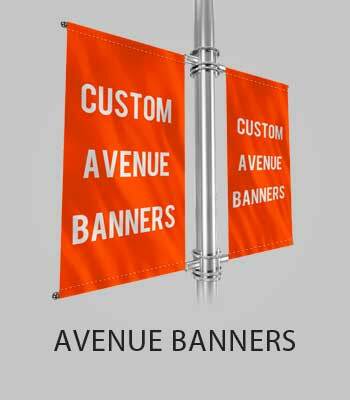 Visit our custom flags page to view our specials and options for your sign. Standard orders ship within 1 to 3 business days. 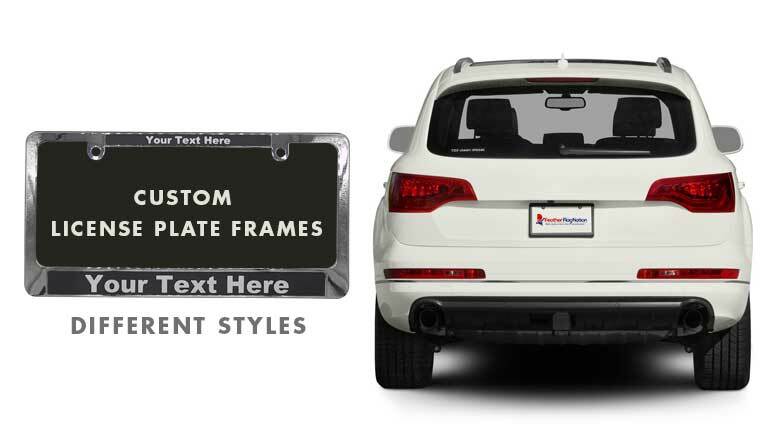 Almost all of our custom signs are available in double-sided prints with grommets or sleeves. 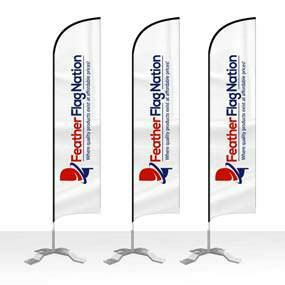 Looking for a particular shape for your advertising flags that you do not see on our website? Contact us. We usually can craft odd shapes for outdoor advertising banners. Send us a sketched image of the design file and we’ll try to make it happen. We love a challenge, just be sure to order early so we have enough time for trail and error. 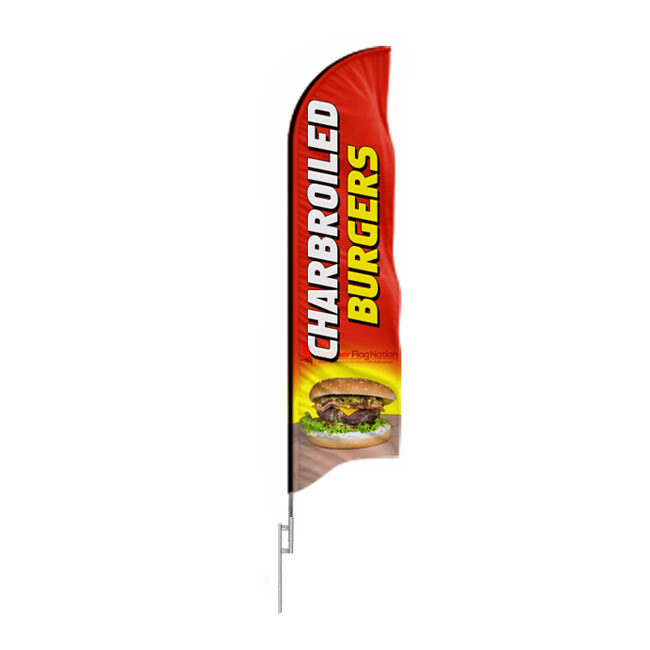 Our stock feather flags will attract more consumers to your business and generate more sales, don’t wait — get a banner flag to increase your revenue. These signs are sometimes called “swooper flags.” If you are on a budget, our 1000’s of stock items are a great starting point to get your signage game started. We take pride in making our custom signs in the USA. Yes, you read correctly — made in the USA. We will not out source our jobs to China. Contact us using the request buttons on top for a free design mock-up. 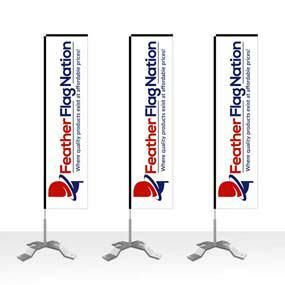 At Feather Flag Nation, you will find a variety of signage options for outdoor advertising. 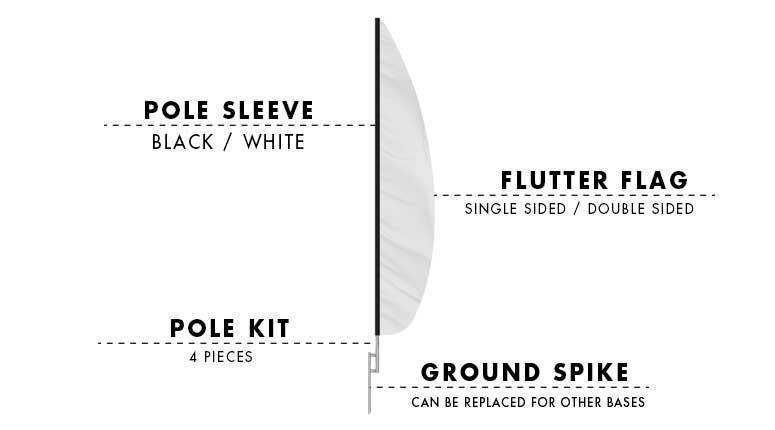 With over a decade of experience with feather flags, we do consider ourselves experts on them. Oh, and we also own the patent to this type of sign, so we did give life to these flag banners. When shopping with us, you are supporting the inventor of this sign, not a copycat like every other website. We offer the highest quality flag banners and air inflatable dancers at the lowest prices. 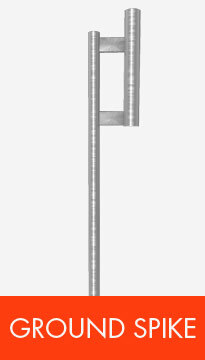 With the patent rights reserved for our feather style flags, we can assure you authentic items. We do not out-source our custom flag production to China or any other foreign location, therefore we provide a quick 1 to 3 business day turn-around time. 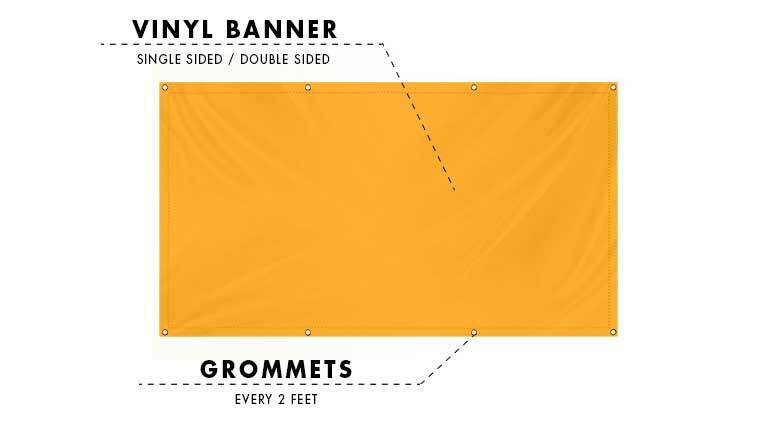 We offer our custom banner flags in 6 different sizes — 8ft, 10ft, 12ft, 15ft, 16ft, and 17ft feather flag kits. 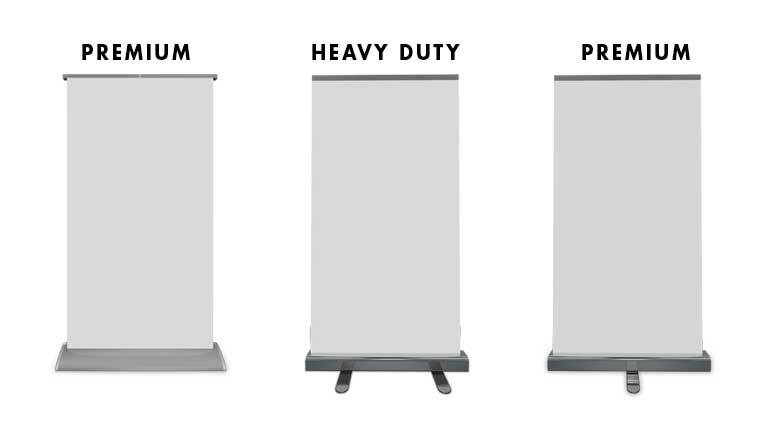 With many sizes to choose from, you can rest assured that one of these sizes will surely work for your event. All of our custom flags come in either single-sided or double-sided banner prints. We use a 100% block-out in between our double-sided flag prints, therefore there is no bleed through from one side to the other. 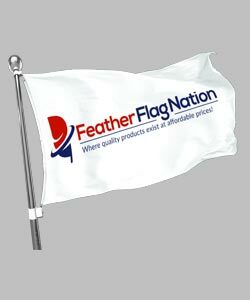 If you are on a budget or looking to save money, we have over 600 stock feather flag designs to choose from. Our stock swooper flags are in stock and ready to ship. Orders placed before 12pm PST usually ship the same day! 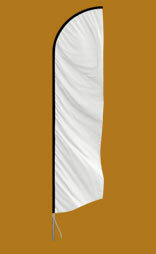 Click on the flag styles under the stock section to view our low-cost stock flag inventory. 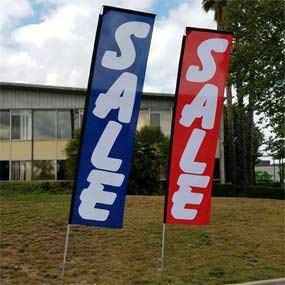 These flags are favorites of all businesses for outdoor advertising. 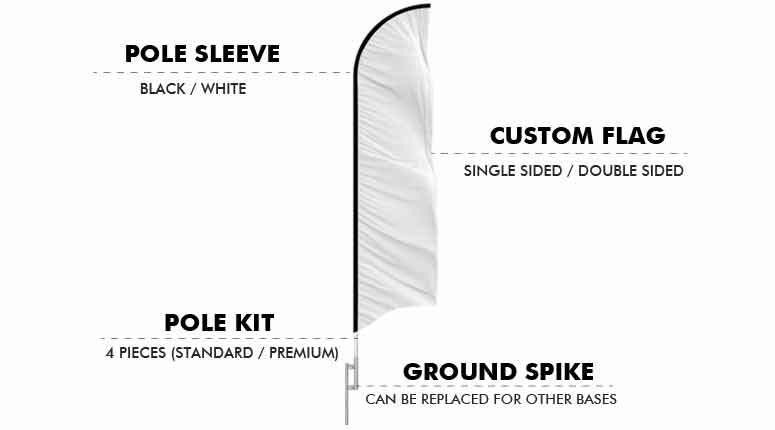 In-stock feather flags are only $14.99 for a replacement flag or $49 for a complete kit, purchasing these promotional flags is a must. They typically pay for themselves within days, if not hours. We are constantly increasing our inventory — check back often for new and updated feather flag designs. With nearly a 1000 different stock designs for you to choose from, it may become a bit difficult to design. Be sure to use the search bar at the very top of this page to quickly look for slogans. Below are some of our most popular flags. With literally millions of cars just in the United States, car washes have become a big business. Because of this, it makes sense that one of our most popular categories would be our stock car wash feather flags. Some of our most popular car wash signs include our car wash flag with bubbles, 100% Hand Wash Flag, auto detail flag, and our free vacuum with wash flag banner. 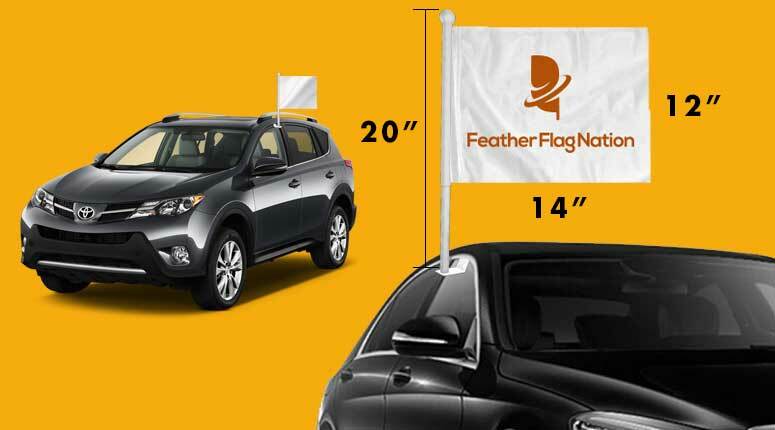 If you own a car wash business, then be sure to take advantage of our feather flag sale to get these advertising flags up in front of your business at some of the lowest prices ever! With many businesses opening up every day, our open and now open flags have hit the top of our list for best sellers. 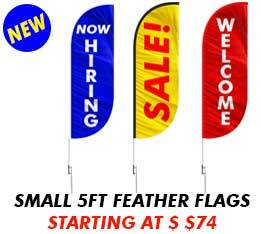 These open feather flags are great for any business on a budget that is looking to decorate their store front. Not only do these flags increase your curb appeal, but they also get you more foot traffic. Some of our most popular open flags include our red and white open flag, checkered open flag, now open flag, and grand opening flag for new businesses. No fancy made-up names for our print process. We’ve modified our printers throughout to years to print high quality custom flags. We use a high density print process which results in high bleed through of most vibrant colors. The back of your flag will not be white, of course unless your base color is white. Since the print process is digital for all of our signs, you are not restricted on colors. Get creative, use live images, rainbows, gradients, or anything else you can imagine. Every custom sign starts as an empty canvas — your creativity and vision is what will help us paint it and bring it to life. We offer a variety of signs that are used at hundreds of trade shows and conventions every year. 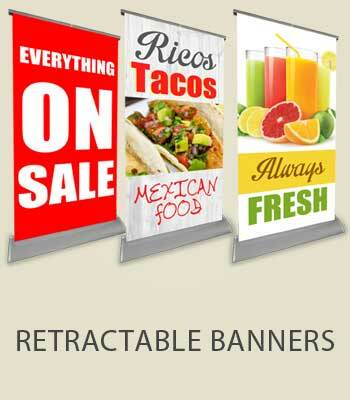 Our most popular products include the roll-up banner stands, vinyl banners, and custom teardrop flags. When all of these signs are used at your booth, you will be noticed. When used properly, you will stand out from everyone else around you. A typical setup would include a teardrop flag on each side of your booth, with vinyl banners tied to the top of your tent. Not only will your location attract a larger audience, but the images of your product(s) on the signs will begin creating instant impressions. Don’t keep your customer guessing – let them know what you have to offer before they walk up to your location. Recently we’ve added a huge inventory of cheap wind dancers. Each air powered dancer is professionally designed to be appealing to everyone. 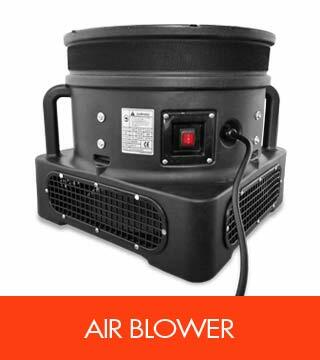 No weird bland faces or cheap materials – our air inflatables are crafted from the ground up to be the best in the market. 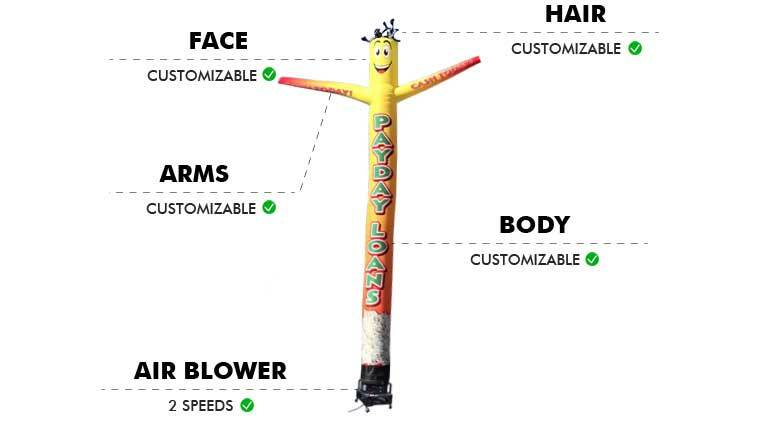 These inflatable tube men are also referred to as wacky flailing guy, waving air dancers, sky dancers, fly guys, and a variety of other names. They are basically the same type of product but vary when it comes to the quality of the crafting materials, body styles, and the printing processes. All of the tubes dance around in the wind with a blower attachment under them. Due to many complaints and issues with the typical nylon material air powered dancers in the market, we’ve taken our time to research and fine tune our proprietary material for our inflatable tube dancers. No, its not a form of nylon! It is a special blend of polyester material that is very strong, and it allows for full color prints and it also outputs vibrant colors, unlike nylon. Our new material allows us to print directly onto the air inflated dancer’s body, which results in rich and vibrant colors and unique designs. 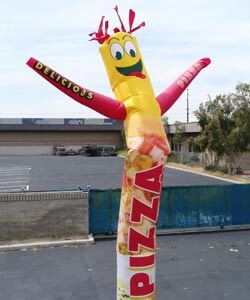 Our custom inflatable tube men will allow you to print live images, gradients, and anything else you would typically print on other custom flags and signs. This is a great benefit because now your inflatable tube man can match your other signs. 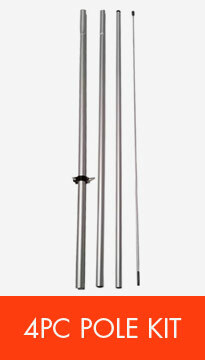 We offer three different options for custom air tube dancers – standard inflatable tube man, tube dancer with an arrow, or plain tube. Visit our product information page to see live images. The most common style would be standard custom air inflated dancer with a happy smiley face, hair, and arms. It is also the most popular and cost efficient option between the three different sky dancers. We work with 1000’s of real estate agents every month. 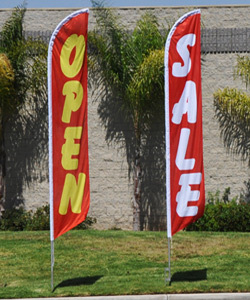 Our most popular real estate flag designs are the “Open House” flags. These are light weight and easy to store and transport with the the travel bags. They are preferred by all agents because they make it very easy for someone to spot an open house. Yard signs are small and often missed – upgrade your tools with these top selling open house signs instead. These open house flags can also be customized with your own company logo & colors, live image of yourself or your agent, and any text that you like. For branding purposes, once budget opens up, we advise all real estate agents to purchase custom open house flags for themselves and their team. As of October of 2017, we have started offering custom car flags again. These high quality 12”x14” polyester window clip-on flags are a favorite of all car dealerships. No inventory of auto dealer supplies is complete without one of these flags. As mentioned, we provide free design services for all custom sign orders. 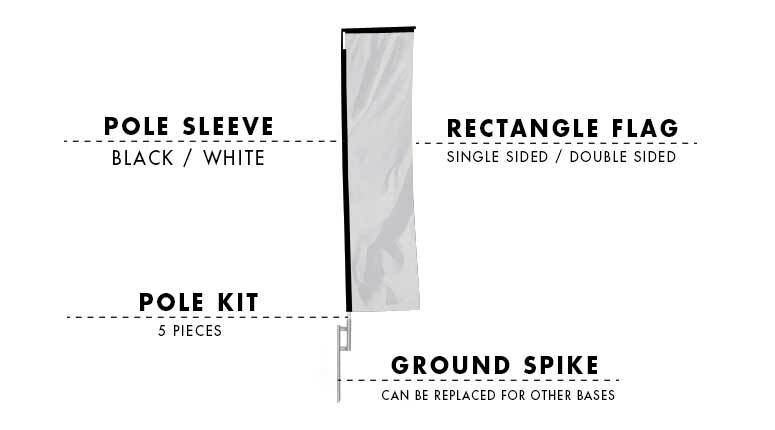 Jump start your business today by purchasing our most popular product – our 15ft custom double-sided feather flag kit. Stay tuned! We will be added new signage options throughout the next couple of years. Our goal is to be your one-stop shop for all of your indoor and outdoor signage needs. Sign up to our newsletter to receive coupons, new product alerts, and other news about the sign industry. We have programs for brokers who are looking to purchase our signs and resell them. You can request a broker quote by using the quote button at the top of the web page. Our broker program is strict and only provides wholesale and re-seller pricing to companies who are in the signage industry. This includes any types of signs — such as business cards, t-shirts, trophies, etc. When filling out the form, be sure to include a valid tax-id or use an email address the provides proof of business. If you are a new business owner or simply looking for more information on the signs that we offer, then you must check out our feather banner flag blog. 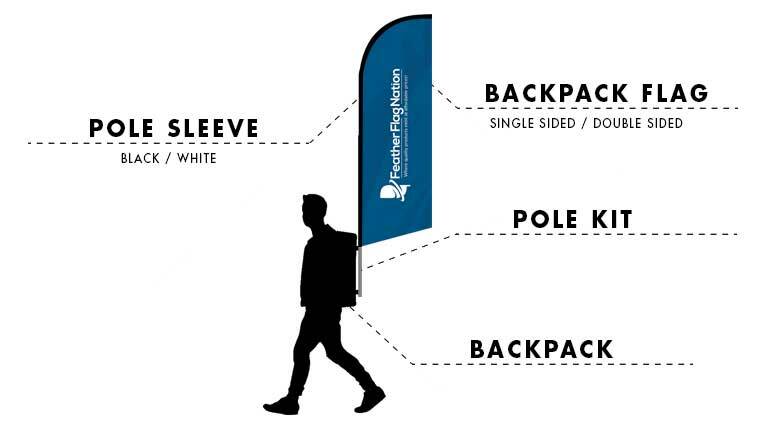 We have tons of articles on how to properly design your custom flags, banners, and other signs. We also have tips on how to increase traffic and sales with things other than just signage. It is a great place to browse while you are sipping your morning coffee or if you are on the fence about purchasing a particular sign. Our main goal is to help your business increase sales with the least amount of money out of your pocket. Your success is our success. Because of our first class customer service and high quality signs, we have nearly a 100% retention rate. A lot of our clients will come back for more signs and a lot of them will pass the good word to their family and friends. A referral of another person is one of the largest compliments that we can get. If you have any issues with your orders, do not hesitate to contact us. We are here to make sure you happy and we will try to do our best to resolve any problems, which are extremely rare! We offer a military discount of 12%. Great for all veteran business owners looking to get discounted advertising signs and feather flags. Discounts apply to active duty members, reserves, veterans and retirees (U.S. Air Force, Army, Navy, Marines, National Guard and Coast Guard). Military spouses are included! We verify via AP/FPO address, .mil email, or a military I.D. The military discount may not be combined with any other offer or coupons. Please contact us at 1.877.900.5692 to get your military discount coupon code.